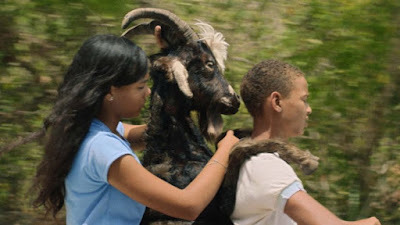 BAD LUCKY GOAT is a wonderfully unique, heart-warming, laugh-out-loud funny film set on a small Colombian Caribbean island. It's the kind of place where everyone knows everyone; even the local bad guy isn't that bad; where superstition rules; and where your mum calls up the local radio station to call you home for supper. It feels a million miles away from urban London, and yet its themes of angry parents, warring siblings and seemingly insurmountable odds are hugely relatable. In sun kissed, beautifully photographed Port Paradise, siblings Corn and Rita (Honlenny Huffington and Kiara Howard) think they've invoked bad juju when they accidentally run over a goat and ding their father's truck. They need to find the money to pay for the repairs before their parents find out which leads them to back to get the dead goat, despite the juju, and essentially strip it for parts. This is done with great gusto and isn't for the faint hearted. We see it part sold to the slightly sceptical local butcher, it's skin used to repair a drum, and the head kept as a kind of totem. All of this serves as a brilliant way to get to know the characters on the island, and for the warring siblings to finally work together and make their peace despite their different values are preoccupations: Corn wants to be a musician, whereas Rita is far more hard-headed and practical. Debut feature director Samir Oliveros has truly crafted a unique and yet relatable film. His observations about the charm and claustrophobia of small-town life, and the decibel level of being in a large family are absolutely on the nose. And his use of editing and music cues for comic effect is confident and impressive. This film truly deserves to become a break-out success and I can't wait to see what Oliveros does next. BAD LUCKY GOAT has a running time of 78 minutes. There are still tickets available for one of the screenings at the BFI London Film Festival.